After the riot at the Manzanar Relocation Center in December 1942, the War Relocation Authority (WRA) decided to remove so-called troublemakers from the relocation centers. An isolation center was established at an abandoned Civilian Conservation Corps (CCC) Camp at Dalton Wells, near Moab, Utah, which had been vacant only 15 months (Figures 14.1 and 14.2). The Dalton Wells camp was used as-is, with no fence or other improvements. Like the relocation centers the isolation center was run by the WRA, headed by Ray Best, who would later be the director of the Tule Lake Segregation Center. Figure 14.1. Dalton Wells CCC Cap in 1937. Figure 14.2. Administration building at the Dalton Wells CCC Camp. Figure 14.3. Leupp Isolation Center. 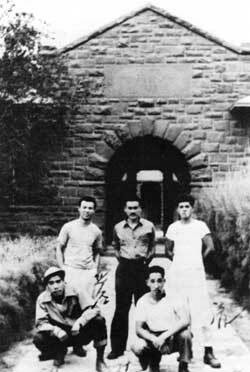 On January 11, 1943, sixteen men from Manzanar were the first arrivals at Moab. Within a few months others from Manzanar and the other relocation centers were also sent to the isolation center, for "crimes" as minor as calling a Caucasian nurse an old maid (Drinnon 1987:104). No formal charges had to be made, transfer was purely at the discretion of the relocation center director (Myer 1971:65). This led to indiscriminate incarceration. For example, thirteen leaders of two separate Young People's Associations at the Gila River Relocation center were sent to Moab. The administration was having troubles with one of the groups and sent the leaders of both on the mistaken assumption that they were related. 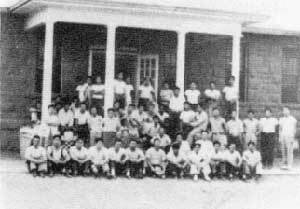 Conflict between those opposed to the relocation and sympathizers carried over from the relocation centers to the isolation center. Further, living conditions were much harsher than in the relocation centers so protests over treatment and conditions continued. To further segregate the population seven inmates at the isolation center were transferred to the Grand County jail in Moab. At its peak the Moab facility held 49 men (Louthan and Pierson 1993). On April 27, 1943, the inmates were moved to an abandoned Indian boarding school at Leupp, Arizona (Figures 14.3 and 14.4). The transfer to Leupp was ostensibly "for the purpose of bringing together the families of those persons sent to [Moab]." However, "incorrigibles" were to be placed in an isolated, fenced area of the camp (WRA Report cited in Louthan et al. 1994), and no families were ever transferred to Leupp. Most of the Moab inmates were moved to Leupp by bus. Five of those held in the Grand County jail, however, were forced to make the 11-hour trip confined in a four by six foot box on the back of a flat-bed truck. On arrival at Leupp, four inmates were transferred to jail in the nearby town of Winslow for a few days before being placed in a jail occupied by six others at Leupp (Embrey et al. 1984). The prison atmosphere at Leupp was enforced by four guard towers, a cyclone fence topped with barbed wire, and the 150 military police who outnumbered the inmates by more than 2 to 1 (Negri 1985). Figure 14.4. Mess hall at the Leupp Isolation Center. More evacuees were transferred to Leupp, for such infractions as drawing pictures that did not meet administration approval, leading a work walk-out, or trying to form a union. Francis Frederick, in charge of internal security at the isolation center, remarked in a letter to a friend "What [the WRA] call dangerous is certainly questionable" (Drinnon 1987). When Ray Best transferred to Tule Lake and was replaced by Paul Robertson, conditions at Leupp improved as the new director became aware of the injustice and illegality of the incarceration (Louthan and Pierson 1993; Negri 1985). On December 2, 1943, the Leupp facility was closed and the 71 inmates present were transferred by train to the segregation center at Tule Lake (Myer 1971:77). The transfer was to have taken place a month earlier, but it was delayed when the military police had to be called in to control demonstrations at Tule Lake.